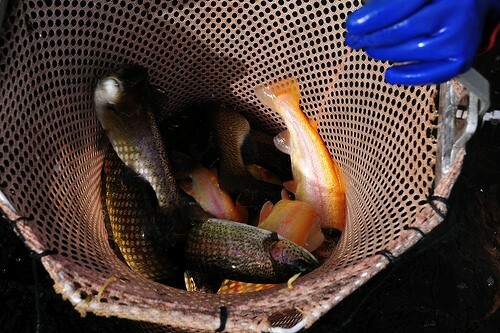 The Maryland Department of Natural Resources will begin fall trout stocking in early October, introducing nearly 28,000 brown, golden and rainbow trout into select Maryland creeks, lakes, and rivers by the end of the month. “I personally have landed my best largemouth, smallmouth bass, northern pike, trout and musky in the fall,” said department biologist and avid fisherman Matt Sell. Anglers can expect this year’s stocked trout to weigh an estimated one-half to one pounds. However, anglers vying for something bigger will have a unique opportunity to try and land trophy size trout, as fish weighing over three pounds will also be added to the mix. Some stocked streams have seasonal restrictions so anglers should consult the 2017 Maryland Guide to Fishing and Crabbing for all related fishing regulations and restrictions. Stocking dates, times, and locations will be chosen based on environmental and weather conditions, water flow and temperatures. Daily stocking updates can be found online and by subscribing to the department’s email alerts. There is also a recorded trout stocking hotline at 800-688-3467, which is updated every Friday during the season.